Home/Blog/It’s a zipper bag party! 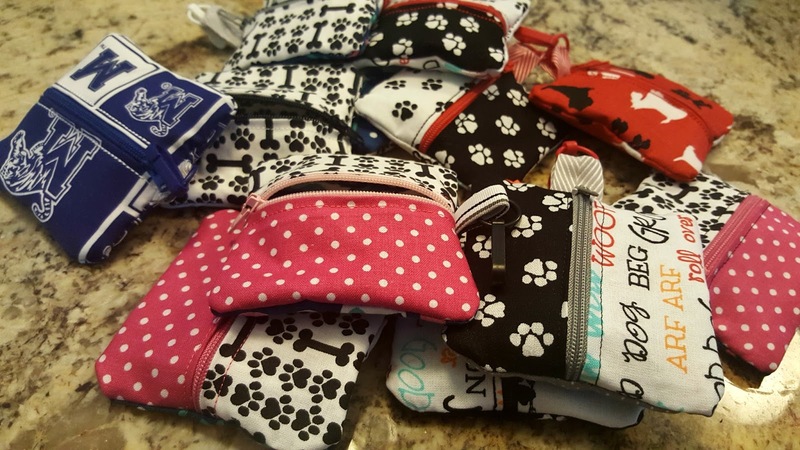 It’s a zipper bag party! Disclosure: This blog post contains links to my Amazon Associates affiliate page, and any purchases you make from that page result in Amazon store credit for me. As always, I would never recommend something that I have not personally used and/or would not purchase with my own money. I had an event one weekend this fall and I wanted to prepare as many zipper bags as I had the time to create! As this event revolved around dog adoption, I chose to make 4×4 bags and stuff each with a roll of doggy poo bags! First, I gathered all my materials. 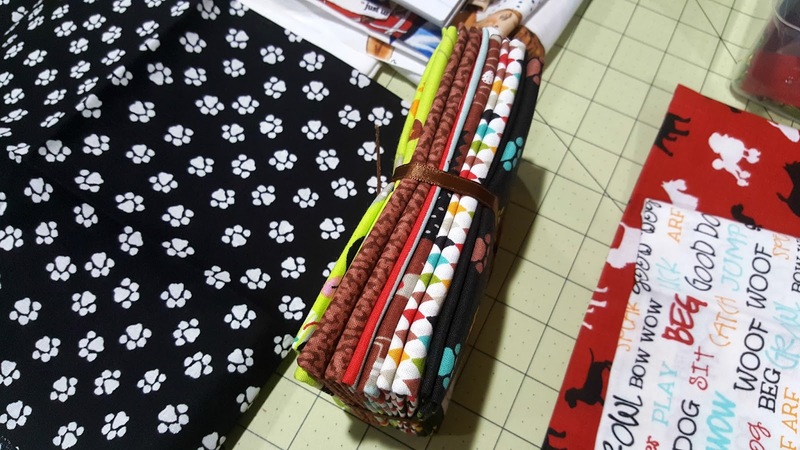 I had collected lots of fabric bundles from WalMart and JoAnn with pet themes. Since these are made from my Zipper Bag 1 design, which has exposed seams, and they’re small, I didn’t bother measuring for every little piece. I just cut two sets of pieces from the coordinating sets: smaller pieces approximately 6″ by 6″, and folded them in half and pressed; and larger pieces approximately 6″ by 10″, and folded them in half and pressed. I placed them in piles in my workspace. These are the front and back pieces of my bags; since they came from coordinating sets, I could just grab from any stack and they all looked great together! The zippers I used are from a huge bag of zippers in a rainbow of colors that I got from Amazon. I used pieces of ribbons from my scrap pile and small plastic clips that I got overseas on Aliexpress.com. I ended up making these bags in assembly line fashion, and all while I was doing digitizing work. Lay a zipper here, stitch a side there. 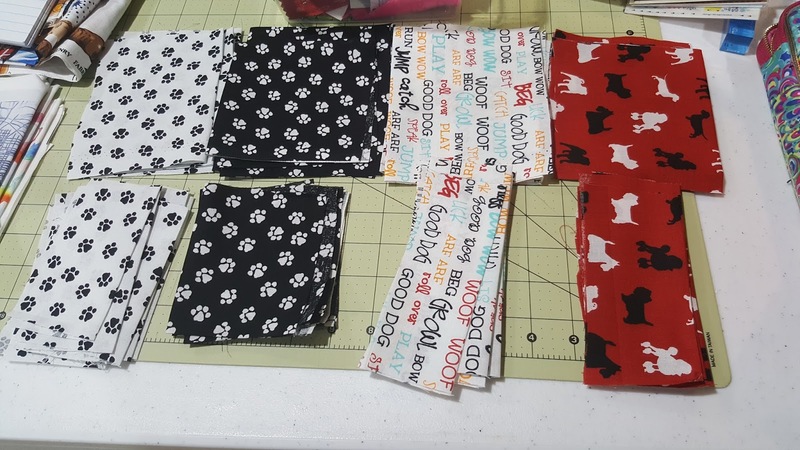 I pulled each off my machine and made a big pile to cut later. When they were all done, I cut, pulled stabilizer, and turned all of my bags. Then I put one doggy bag roll inside each one and zipped up! I loved how each one looked slightly different.